Ida is a great name for a lake (unless it is a hurricane) but if the timing had been a little different the name could’ve been different. Lake Ida was named by Myron Colony, one of the first people to settle at the lake. Myron had an east coast girlfriend named Ida and but he ended up marrying a girl named Josephine. But, it was while dating Ida that the name was applied to the 4,426 body of water in Alexandria. This information is courtesy of the Douglas County Historical Society. Another interesting piece of history I found is that there was a woman that cleaned houses at the Betsy Ross Resort whose name was Ida Lake. Update: Note the information provided below via comment by the publisher of Uffda : Idle thoughts from Lake Ida. At her blog, a few of Myron Colony’s relatives read a post about Lake Ida history and added comments. They said Mr. Colony had a family friend named Ida DeSollay that was a performer. After reading this I recalled information I added to craigmische.com (now shuttered after beginning alexmn.com…I lost a lot of content but never liked a site named after myself as that wasn’t what it was about) years ago after research at the Douglas County Historical Society. Myron Colony was said to have been the first person in Alexandria to have a piano. He had it delivered by a boat that traveled up the Mississippi River to St. Paul and then was brought by an ox team to Alexandria. Maybe he enjoyed playing or had it brought for his friend, Ida, to perform for everyone at the lake? 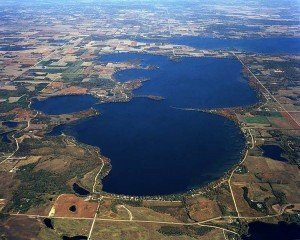 I blogged once about Myron Coloney, and last week I had a reply to my blog about how Lake Ida was named. A descendant of Myron Coloney explained about the mysterious Ida. Read the comment after my blog entry. Ida was Ida LeSollay, a performer. Sounds like a stage name. I did not find anyone with that name on early censuses. Thanks Taryn! Really interesting and I am glad you and the others took the time to share. I am away from my desk right now but will add a note to my post later today. Ironically, I am on Lake Ida right now (iPhone safely in a waterproof case). It is 72 degrees so I decided to take an hour on my Stand Up Paddle Board. Stay tuned for a photo later. After reading what was shared on your site about Ida being a performer I recalled that I had previously read that Myron Colony was the person to have a piano in Alexandria. It was delivered by a boat that traveled up the Mississippi River to St. Paul and then was brought by an ox team to Alexandria. Maybe brought for Ida LeSollay to use? i am the great great granddaughter of Myron and Josephine Coloney. Though Myron named Lake Ida for Ida Florida Sollee, he was married to beautiful Josephine, who moved to Minnesota with him, and who brought with her her piano, which she owned before marriage. Thank you! Very fun to hear the real story from the family. This question of the names comes up again, because book research is going on now, and the Lake Ida naming question has arisen. Dale says Ida Florida Sollee is the person Lake Ida was named for, but the dates for the one I found are not right. There are several mentions online about an Ida Sollee, an actress in New York. But most of those references are in the late 1880’s and later. So I think Ida is still a mystery. Hi again! Thought you might be interested in the book I’ve written about Myron and Josephine.